Cider brands have bucked the downward trend to be one of the only growth segments in the Australian alcohol category with a 10% increase in regular drinkers aged between 18 and 24 since 2006. 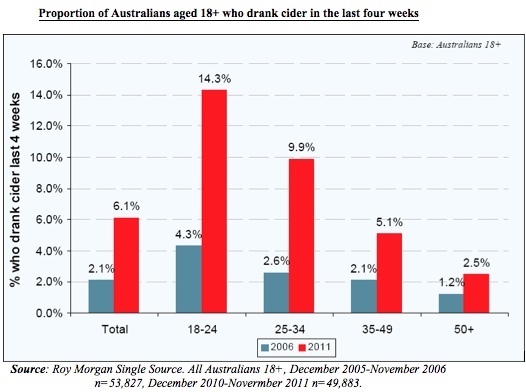 The findings, from Roy Morgan’s Alcohol Currency Report, show that popularity of cider has grown across the board with 6.1% of Australians aged 18 years and above drinking cider regularly (at least every four weeks) in 2011, up from 2.1% in 2006. According to Norman Morris, industry communications director at Roy Morgan Research, the majority of the growth is coming from new or smaller, boutique cider brands: “Cider is following the trend we’re seeing with beer where microbrew or craft brands are growing – the boutique players are emerging as more appealing to drinkers,” Morris says. Morris also comments that cider is tapping into needs that were not previously being met by other types of alcohol. “While we have seen a decrease over the last five years in the proportion of 18 to 34 year olds drinking any type of alcohol, and a corresponding decrease in the proportion of younger adults drinking wine, beer or spirits, a higher proportion of this age group is now drinking cider,” Morris says. Cider, says Morris, has traditionally been seen as down market and blokey in Australia, but is now experiencing a raft of product innovations with new flavour variants, blends and seasonal versions infiltrating the market. However, despite the softening of the product, men are still more likely to drink cider than women according to the research.